You are What You Imagine offers a compact program for navigating yourself clear of your most stubborn life challenges. 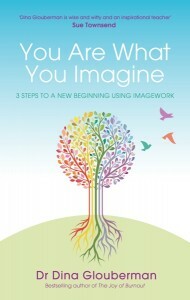 In the book, I teach you how to use the simple process of “imagination training” I call Imagework. Imagework will allow you to hear the whispers of your heart and soul and find out what you truly want, not what society tells you you should want—and then make it happen—whether it is love, success, health, happiness or changing the world. Each step of the process is illustrated with quotes and interviews with friends and colleagues as well as prominent figures. Interviewees include Samaritans founder Chad Varah, visualisation pioneer Shakti Gawain, Five-Rhythms creator Gabrielle Roth, men’s movement leader Robert Bly, award winning actor Michael York and many others. I have designed the book so that each of the ten chapters has the feel of a self-contained workshop. For example, chapter one, “Seeing your way to a new beginning,” shows how the processes that bring us to the point of utter frustration and burnout can lead us toward our next step. It encourages you to see yourself at a starting point rather than at the end of your rope. Once you realize that what looks like the end might actually be a new beginning, you’re ready to ask yourself, “Where am I? Where do I want to be? What’s stopping me? What do I need to get past this? What is my true nature?” Each chapter of the book has a “Spiritual Gym” section where I will help you work through whatever is blocking you and find your way forward using Imagework. A Spiritual Gym audio recording is available to purchase separately which will take you by the hand and guide you through the Spiritual Gym exercises. A Three Steps to a New Beginning courseoffers the opportunity to do this with me as facilitator and in the company of a group of like-minded people to support and encourage you. Many of my clients and students have told me that learning Imagework is like learning to swim or ride a bike—once you know how to do it, you never forget. For that reason, you will find that after reading this book you will have a lifetime membership in the Spiritual Gym. Once you have a solution to your most urgent life challenges underway, you can go back to the beginning and use the exercises to get cracking on another challenge. You are What You Imagine is a powerful synthesis of my life’s work. It offers a way forward to using your imagination not only to change your own life, but to benefit the world around.